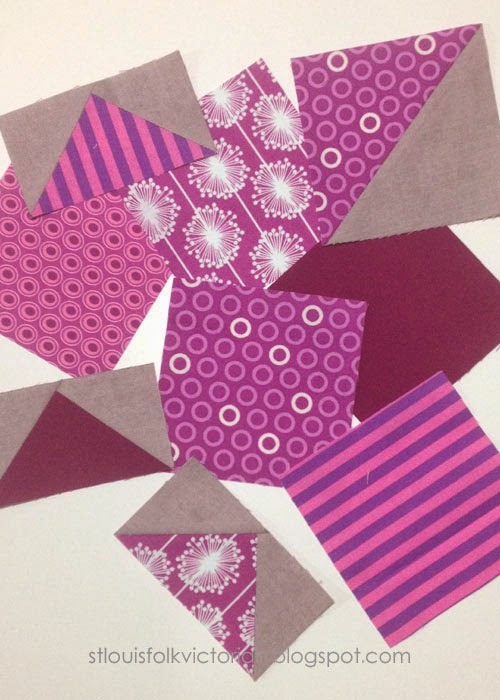 And it's done...my entry into the Radiant Orchid, Pantone Quilt Challenge, that is. I am linking up with Adrianne and Anne today. If you haven't had an opportunity to check out the entries, hop on over there. 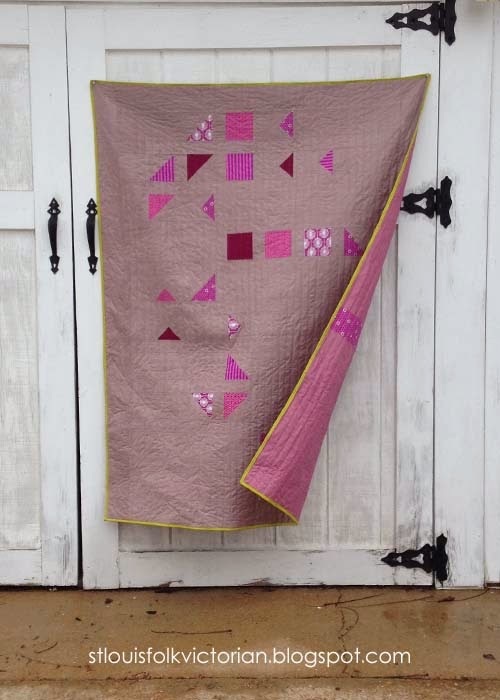 You can see this quilt's beginnings here ====>. Yet, I am happy to introduce you to this yet to be named; but probably will remain Untitled quilt. 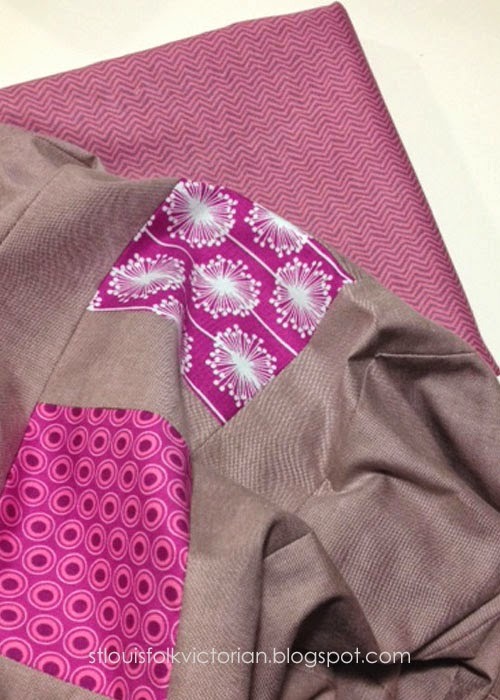 I pulled together a collection of prints and married it with this Peppered Cotton from Studio E. The color is called "Ashes of Roses" and it was the perfect neutral, as it has just the slightest hint of pink while still remaining fairly taupe. My design was inspired by this Abstract Print from FunMakesGood. To achieve this look, I made several HST (Half-Square Triangles), Flying Geese and added lots of sashing and negative space. Dear Stella (Piper Zig Zag in Punch) print could not have been more perfect as a backing fabric, I was so pleased to have found it. I finished the quilting and added the binding at my guild's Sew-In, and couldn't resist taking this photo during the process. 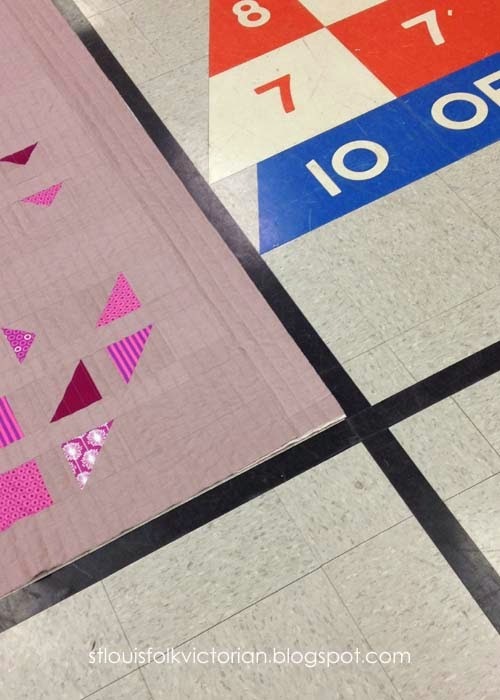 Having a Sew-In in a gymnasium was perfect as the tile floor provided the perfect area to "square-up" one's quilt...and having a shuffleboard close by was fun too. Speaking about the binding, did you see the color? I cannot take credit for that addition, as my friend, Rene, after seeing the quilt top during an earlier Sew-In; suggested that I add a hint of green...and she pointed to a bottle sitting across the room. Some hours later, while I was out buying the backing fabric, I found the perfect color binding...just like the bottle. It's Weave by Moda 9898, color Chartreuse. 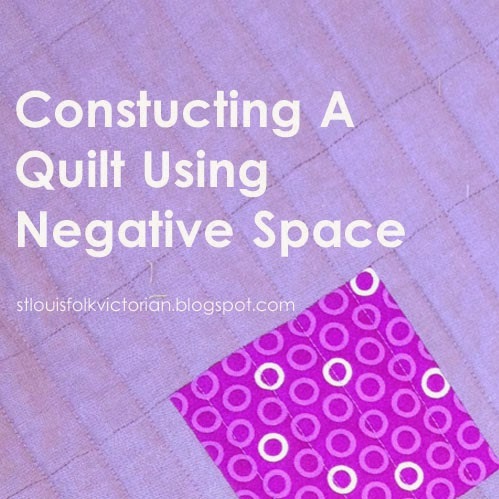 I highly recommend that you consider playing along with the next Pantone Quilt Challenge, as it is a great way to work with colors that you would not necessarily play with. If you would like to see all of the colors Pantone has chosen for 2014 Spring, check out their site. While Radiant Orchid wasn't on my radar before, it certainly is now. 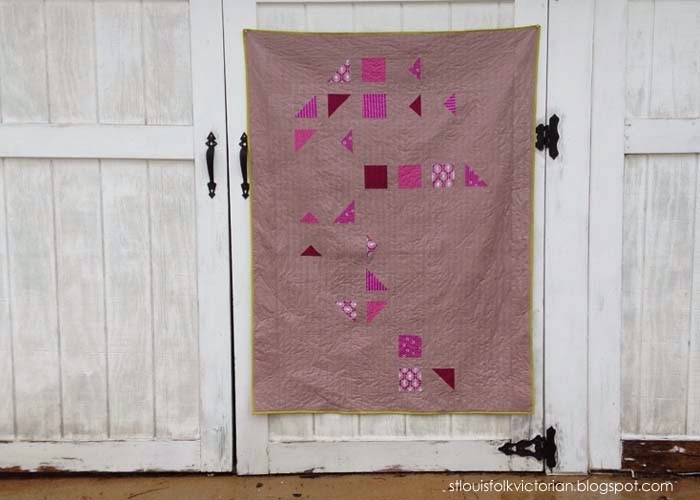 If you would like to learn more about how I constructed this quilt, I've written a reference guide/tutorial. The chartreuse looks great as the binding, and I'm also interested in the back, that wind swept sneak peak we got looks like it is a pieced back. Thanks for playing along Kristy - your quilt is gorgeous! I love how super modern and abstract it is, while still being warm and colourful. And that binding is just perfection! How very modern of you! I agree with that chartreuse, it's a perfect accompaniment to radiant orchid! love this so much - the binding is perfect! Love it! The green binding was definitely the perfect finishing touch. 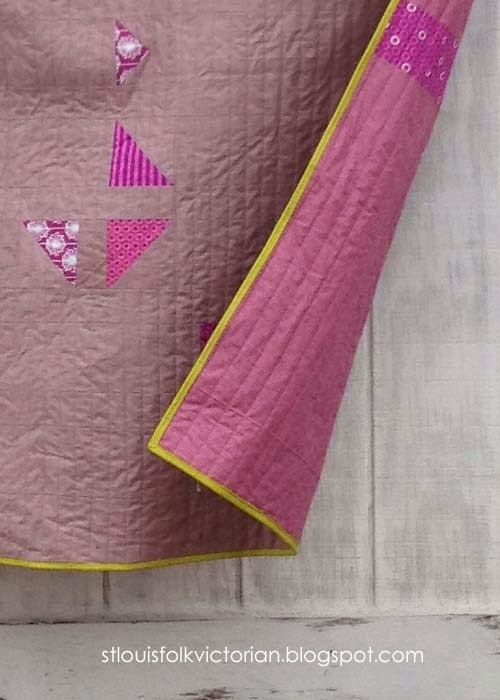 Chartreuse is such a great color with radiant orchid, and it frames your beautiful quilt perfectly! I love the abstract/modern art inspiration for this. It's truly a gorgeous quilt! What a stunning quilt - the colours are amazing. WOW! Great "bottle" binding! There is something about this quilt that makes it unforgetable! Very good job.